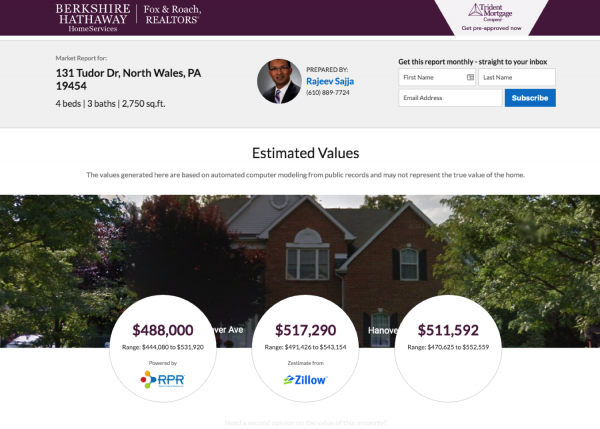 There are a lot of technology applications that look promising, none more so than the recent launch of their Home Valuation System on foxroach.com powered by Buyside™. Fox and Roach is the largest Berkshire Hathaway Home Services company. Their offices cover many regions including Southeastern Pennsylvania, Southern New Jersey and Delaware. In WAV Group broker website effectiveness studies, BHHS Fox & Roach ranks in the top 10 for the most traffic of any broker in America. Last month, they launched the Home Valuation System, built by Buyside™ that created a landing page for every off- market property and IDX listings in their market footprint. This is a broker-friendly solution that provides benefits beyond Zillow® the national leader in displaying data on off-market properties. The goal of the strategy is to develop seller leads for their agents, and engage buyers and property owners with good information about property values and the ability to track a home. In the first 45 days, Foxroach.com has had almost 51,000 valuation attempts done on their agent branded landing pages powered by Buyside™. It’s important to note that BHHS Fox and Roach rolled this feature out on both the broker site and agent websites. The broker site generated 68% of the traffic with just under over 34,000 of the valuations, and incredibly over 1300 agents participated in generating the other 32% or 16,000 for their own agent sites. There is truly a network effect that occurs when agents leverage the broker provided co-branded websites. BHHS Fox and Roach leverages the CoreLogic AgentAchieve™ broker and agent website platform which provides easy integration of the Buyside application. Buyside has also integrated CoreLogic’s ePropertyWatch into the BHHS Fox & Roach’s Home Valuation System. With ePropertyWatch, consumers can register to get an automated monthly email with their property value, recent transactions, new listings, etc. The off-market or IDX listing property pages encouraged a 7% registration rate to the ePropertyWatch service and an additional 1% of consumers contacted a specific agent. It’s forecasters math, but if you add up the number of seller leads generated from the Buyside™ app, it equates to filling the top of the listing funnel with $16.5 Billion in listing opportunities. Over time, BHHS Fox and Roach will be able to map listings back to this lead generation source to measure the outcomes from the bottom of the funnel. The company also intends to track the volume of leads that convert to a listing presentation too. There is likely more business volume that will also accrue to the company’s Mortgage, Title, and Insurance businesses. All in all, it’s a dynamic edition of seller lead generation that accompanies an already high performing buyer lead funnel.